That's one of Bunny's awesome carrot cupcakes in the back. It's topped with candied ginger (too cute!). 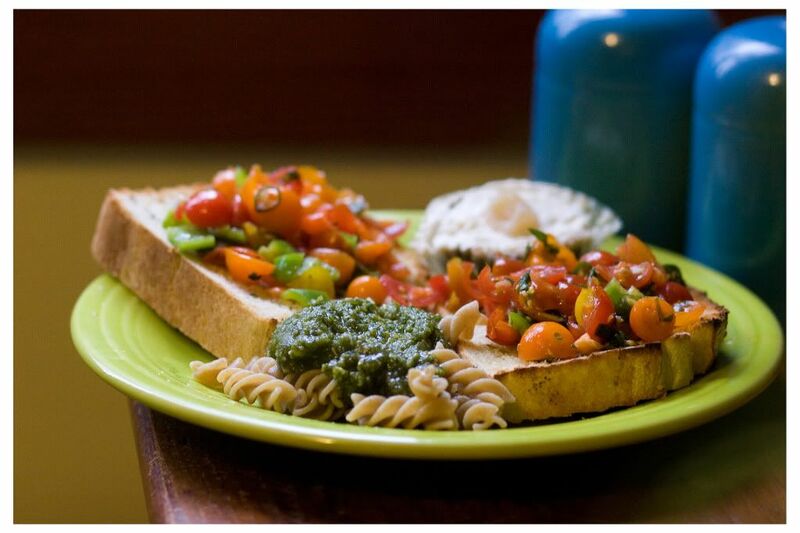 Last Sunday Rob and I made vegan pesto (with our very own basil) and some great bruschetta too. We spent most of the day in the garden planting collards, kale, broccoli, cabbage, and Brussels sprouts, and then we picked a big basket of basil and clown nose peppers and went in and started cooking. Anyway, we made a great oily high-calorie pesto with loads of pinenuts and homegrown garlic. We served it over whole wheat fusilli. I made the bruschetta topping with organic heirloom tomatoes I bought at New Leaf Market; they came in all sorts of funky shapes and colors. The bruschetta recipe calls for a baguette, but I used some great rosemary-olive bread that Mom bought me at the Tallahassee Downtown Market. Combine all ingredients with an immersion blender until nuts are ground and you have a smooth paste. As a cautionary note: I try not to pack the measuring cup with basil leaves--because if you add too much basil your pesto will be really bitter. I like it best when I have more pinenuts and less basil. Preheat the oven to 450 degrees. Add the tomatoes, peppers, basil, garlic, vinegar, olive oil, and salt and pepper to a bowl and stir to combine. Slice the baguette, brush the top of each piece with olive oil, and arrange the pieces on a baking sheet. Toast the bread until golden brown. Using a slotted spoon, top the toasted bread with the tomato mixture and serve.